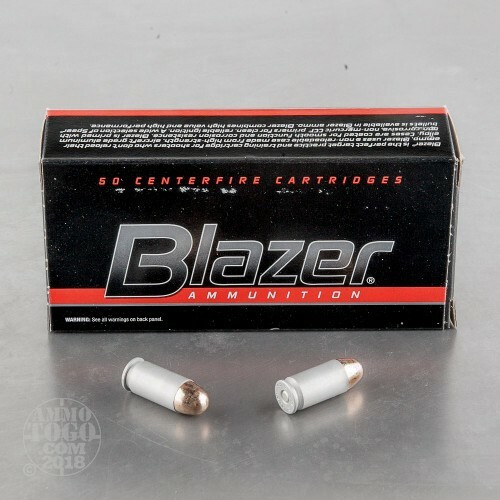 What you will have already noticed first about this 45 ACP cartridge from Blazer is its shiny casing. It’s not nickel plated brass, but rather heat treated aircraft grade aluminum. Aluminum’s so vastly abundant in the earth’s crust and inexpensive to refine that it’s a significantly more cost-effective medium to make casings out of than brass is. It’s also only one third as dense as brass, making this box of rounds and by extension your pistol’s magazine a whole lot lighter as the result. 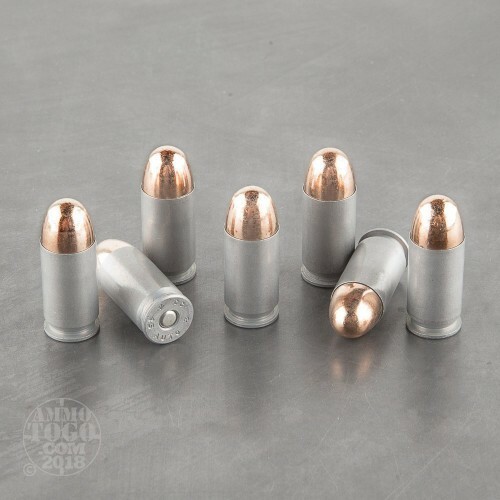 You’ll not be reloading these rounds, nor will you be firing them at ranges which take issue with aluminum -- outside of that, they’re a great deal. 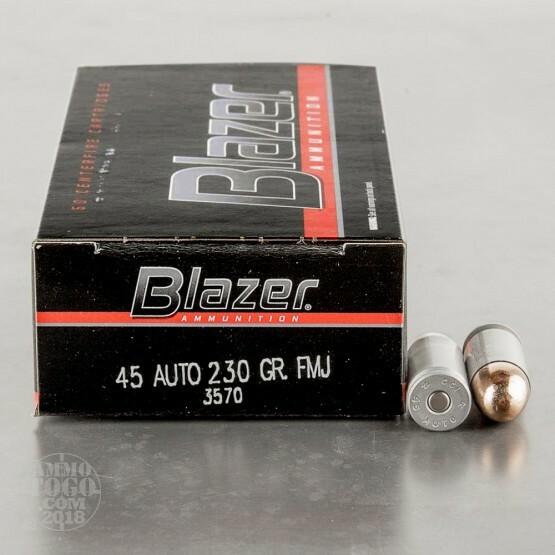 This cartridge sports a 230 grain projectile, the original bullet weight for their caliber. The bullet’s full metal jacket will cause it to feed without problems in your semi-automatic pistol, enable it to penetrate targets easily, and prevent accuracy depleting bore fouling. This round’s non-corrosive primer is made by CCI, and accordingly very sensitive and effective. 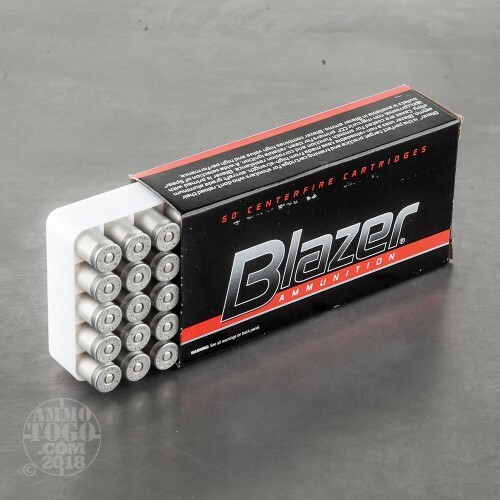 Great inexpensive ammo. Shoots good, burns cleaner than most, and I have had no FTF/FTE problems at all after 500rnds. They worked well in my 1911 and my 845. If you don't reload these are the cheapest rounds you can buy. Shoots good. No issues in glocks, kimbers, or HK's. It is a bit dirty but not too bad. I compare it to shooting federal out of the 50 pk red boxes. Accurate enough for me. I practice mostly defensive shooting so distance isn't overally necessary to me. Not with a pistol anyway. I recommend it for high volume shooting or combat classes. Just be sure to clean your weapon after shooting and you'll be set. This stuff works great in my FNP-45 and my friend's Kimber and Springfield. It's accurate enough for our tastes as we only practice for medium to close range and tactical entry/ home defense type shooting. Leaves behind a dry and scaly mess after 50-100 rds though. But this is to be expected from the cheap stuff. Easy enough to clean out with a few patches at the range, and requires a little soaking at home, but for the price it can't be beat.